If you work with or serve deaf and hard of hearing people, finding communication accommodations can be challenging. Did you know that captioning is not always the solution? Many people who have a hearing loss rely on American Sign Language (ASL). 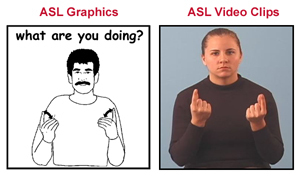 ASL is a complex visual / gestural language that is distinct from English and has its own grammar, syntax, vocabulary, etc. Unlike English, it has no text representation. Many deaf and hard of hearing people who rely on sign language for communication do not have good facility with English. For them, spoken English is not accessible and written English difficult to master because it depends on decoding the sounds of letters. Thus, to improve employee and customer communication experiences, translation of English to ASL is necessary. IDRT’s ASL Translation Services can provide the expertise and experience to assist your organization accommodate deaf and hard of hearing individuals using a language they can understand. We can deliver the ASL translation in a variety of ways! IDRT’s team of translators, proof-readers, and project managers, coupled with our unique, proprietary, state-of-the-art translation technology, is ready to address all of your English-to-ASL accommodation needs. IDRT uses three variables to measure the quality of our translation services: accuracy, consistency, and reading comprehension. A professional translator performs the initial translation. A different translator proofreads the translation. 2. An industry specialist is consulted as a content manager and / or proofreader for technical translations. Each translator has successfully completed an extensive screening process and typically has worked as a professional translator for over 5 years. We have translated materials from English to ASL for organizations such as Walmart, NASA, AT&T, and Lamar University. Why does the volume of content affect the rate? As a general rule, the greater the amount of content to be translated, the lower the cost per word, as our translators can be more efficient. How does the time frame affect cost of translation prices? As with most services, there is normally a premium cost to get “priority” service, and translations are no different. Tight time frames require more project management, and translators have to be shifted off other projects, all of which affects the price. How does type of content affect translation prices? We work with the goal that our translations are accurate, reflect the correct context, and are free from typos. For content that is difficult to translate (e.g., technical or scientific manuals), we may consult with professionals who have expertise in the content field or spend time considering how best to express complex concepts in this visual language. In such cases, the pricing may be higher. Please contact us at 301-942-4326 for a price quote. or full video) Softcopy replication with 1. ASL embedded videos or 2. embedded links to the ASL Videos* in a Microsoft Word or PDF Document. Softcopy replication with 1. ASL embedded videos or 2. embedded links to the ASL Videos* in a Microsoft Word or PDF Document. Softcopy replication with 1. ASL embedded videos or 2. embedded links to the ASL Videos* in a Microsoft Word or PDF Document. Deliver ASL Videos or links to the ASL Videos. * Purchaser would embed the ASL Videos or the links in their respective program. *IDRT would host the ASL Videos and the user would need an internet connection to access the ASL Videos. © 2012 Institute for Disabilities Research and Training, Inc. All Rights Reserved.